Every year, food bloggers around the world donate bid items in an effort to raise money to benefit the UN World Food Programme. (You can read more about it here.) For every $10 you donate, you get to bid on one of many fantastic items. This year, I’ve decided to donate a bid item as well. 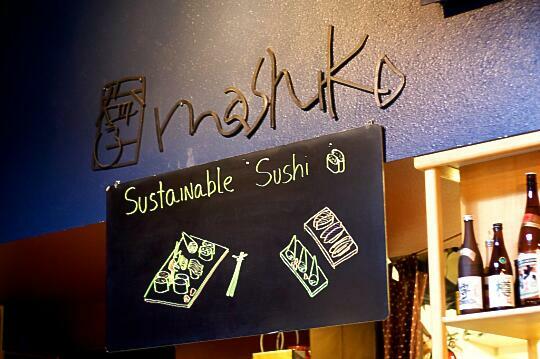 As many of you know, I cannot rave enough about Hajime Sato’s Mashiko Sushi Restaurant in Seattle, WA, nor can I stop talking about Casson Trenor and his book, Sustainable Sushi: A Guide to Saving the Oceans One Bite at a Time. Casson has been amazing enough to donate a signed copy of his book, and in addition to that, Hajime has donated a $50 gift certificate to Mashiko. Choose a bid item or bid items of your choice from our Menu for Hope main bid item list. If you want a chance at Casson’s book and a $50 Mashiko gift certificate, our bid item code is UW42. Please specify which bid item you’d like in the ‘Personal Message’ section in the donation form when confirming your donation. You must write-in how many tickets per bid item, and please use the bid item code. Check back at Chez Pim on Monday, January 18 for the results of the raffle. Just found your nice blog – I am *not* a seafood person, let alone a sushi person — but I’ve just found out that as part of a job interview I’ll be taken to a sushi restaurant for lunch. Any recommendations? I’m not a complete neophyte; I’ve had California rolls and the like (and can down them, but don’t love them); I don’t want to just stick to tamago and gari (both of which I *do* like). Can you give me any advice or help? S Loyd – Mashiko is definitely a good one, and although I have not yet been able to try it, I hear that Tataki in San Fransisco is great as well. If you’re ever in Honolulu, HI, definitely try Mitch’s – I reviewed them a while back here on Sushi Day, and they’re among my favorites. Jeffski – Most sushi restaurants, especially those that are more than just a sushi bar, will have teriyaki chicken or tempura entrees, so you don’t have to have sushi or seafood if you don’t want to. If you want to try sushi, I recommend anything vegetarian with tempura. Also, the Philadelphia roll is pretty common, and good if you’re okay with smoked salmon (smoked salmon and cream cheese). I went to Mashiko Sushi on my trip to Seattle last year. It truly is a great place. Although sushi places have sprouted up all across the country, finding a truly great quality sushi restaurant is still quite a challenge. Great job on raising money for a worthy cause. good luck with your fine sushi cause! I love sushi and I’m sure other people too. I love sushi too thanks! mine too i love that sushi! good luck with your fine sushi cause! .. I love sushi too thanks! !